If you know me at all, and I mean in the slightest bit, you should know I love pizza. I've made this crust many times. Sometimes I substitute some whole wheat flour for the white flour and yes, it changes the taste and texture a little bit. Homemade pizza isn't necessarily cheaper than the $5 pizzas in town. But, we don't live in town. And it gives me a chance to get the kids in the kitchen with me. This recipe makes a larger pizza for Brad and me, and a smaller pizza for Ben & Em to each make their own. The crust fluffs up nicely, but not too much. You could really stretch it if you like thin crust style pizza. 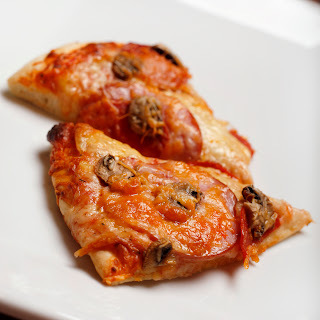 My favorite is a combination of canadian bacon, pepperoni, and fresh mushrooms. I'll have you know it took much self control on my part to remember to photograph this before I ate it! For the sauce, I open a can of tomato sauce and add Italian seasoning to it. In a mixing bowl with dough hook combine flour, salt, sugar and yeast. Mix together. Slowly pour in warm water while mixer is running. Let mix on low for 10 minutes. Cover and let raise for 1-2 hours until double. Cut dough in half and roll out into 12" circle. Top with sauce, cheese, and toppings. Bake at 425 for 15-20 minutes.